Gaming Club is an online casino featuring real casino games that also happens to the first of its kind, having opened its doors in 1994. The casino has maintained its solid reputation by offering players the newest and best features, including a gaming collection of over 400 unique titles and frequent promotions. Players who are member of Gaming Club get access to customer service that is available all around the clock and multiple options for completing deposits and withdrawals. Gaming Club online casino is host to a fair and safe experience due to its focus on the latest security measures, and the casino is officially registered in Malta and licensed by the Malta Gaming Authority. This online casino is available as a full desktop version and also in a cutting-edge mobile format. Players who come to Gaming Club online casino will find an expansive catalog of casino games, including dozens of online slots. Each slot game is professionally designed with the best in visuals and sounds, and players can expect all types of gaming styles from a classic 3-reel machine to an advanced 5-reel video slot. Gaming Club often hosts slot tournaments where players can compete to obtain the highest score and win bonus prizes. Gaming Club’s online slots are provided and powered by Microgaming and include the biggest hits such as Golden Era, Hound Hotel, and Wild Catch. The casino has a lot in the way of online slots, but it complements this selection with a variety of other real casino games that players can enjoy. Gaming Club has multiple titles in the way of roulette and blackjack, as well as an online twist to video poker games. Similar to the promotions related to the online slots, Gaming Club also regularly hosts tournaments for blackjack that allow players an opportunity to win great prizes and rewards. The casino is a destination for innovative live dealer games, allowing players to compete against each other while an actual dealer controls the action from Gaming Club’s casino studios. This cutting-edge casino format adds additional realism and a more social aspect to each supported game. Gaming Club supports safe and fair play by regularly auditing all of its gaming content to check for consistent payouts and random generation of numbers. These stats are then reported to players by the casino on their site. This transparency allows Gaming Club to remain certified and trusted as a premier online casino. In addition, the casino teams with Datacash Ltd to process all payments, ensuring that any information the player gives is encrypted and protected from security threats. Players who feel like they are developing a gambling problem will have access to various hotlines and resources that Gaming Club makes easily available, including self-exclusion and cooldown periods for member accounts. There is a great need for excellent player support at casinos, especially when the gaming venues are based on an online platform. Because of this, Gaming Club offers multiple ways for players to get in touch with the professional support team at all times of the day. The best feature for urgent requests is the live chat option, as it instantly connects the player with a trained expert who can resolve issues right away. There is also an e-mail option available, where players can fill out a contact form online and expect a response typically within two hours. Additionally, Gaming Club online casino has multiple phone numbers that the player can call if they prefer this method. Gaming Club facilitates the use of many different banking options for players all over the world. These include major credits cards such as MasterCard and Visa, which can be used for both deposits and withdrawals. The casino also uses the services of web wallets like Skrill and Neteller, which are popular for having quick turnaround times. Players will find that using either a card or an online teller at Gaming Club will give them lightning-fast processing and a pending period in case they change their mind. As an added benefit, these banking options are also available for players who access the casino through a mobile device. Alternative payment methods are made available based on the player’s region and currency. 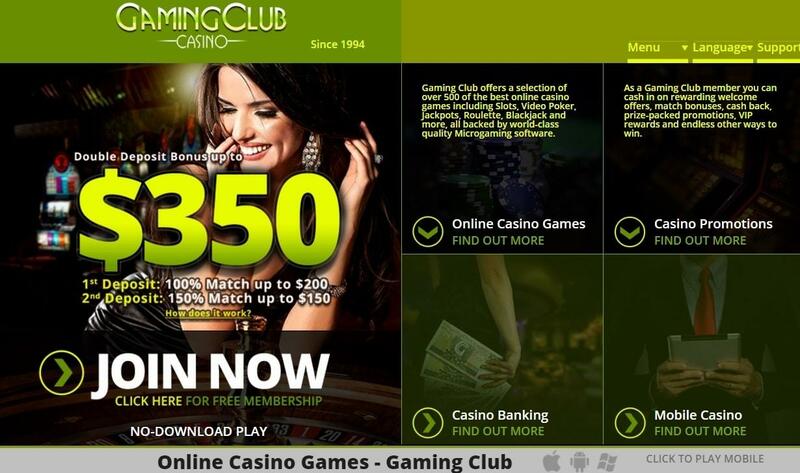 New players who are considering signing up at Gaming Club online casino will be able to take advantage of the site’s impressive welcome bonus. This particular bonus is split into two different parts, and each part consists of a deposit matching bonus. After completing the first deposit, the player is eligible to receive as much as 200£/€/$ in credit for free based on a 100% match. In a similar fashion, the second completed deposit will be matched by 150% in an amount up to 150£/€/$. This allows each new member of Gaming Club to take in a total bonus of 350£/€/$ when signing up to play. Aside from the welcome bonus, the casino offers all players percentage matches throughout the week that will be awarded based on deposit amounts and playing activity. The VIP program at Gaming Club consists of a points system that rewards players for how much they deposit and how much they play at the casino. Each credit used on any of the online casino’s games goes toward the player earning loyalty points. As players earn more points, they will progress to a higher level in the VIP program, where they can receive exclusive discounts and benefits. Gaming Club provides personal account management and even specialized gifts to its most loyal VIP players. Gaming Club online casino understands the need for players to be able to enjoy their favorite games even when computer access to the site is not readily available. As a result, the casino has designed and released an exclusive mobile version of its site that can be played through almost any mobile device. Gaming Club mobile casino works by taking the same great real casino games and optimizing them so they perform flawlessly on a touchscreen device, without sacrificing any of the quality or features that would be included on the full site. Players using the mobile casino will also have access to payment options and customer support if needed. The Gaming Club mobile casino can be used from anywhere with an internet connection and performs on iOS, Android, and Blackberry operating systems.